Milk chocolate eggs with a soft caramel centre (37%). Little caramel filled chocolate eggs that are great for Easter egg hunts, if you can bear to share that is.... Suitable for vegetarians. 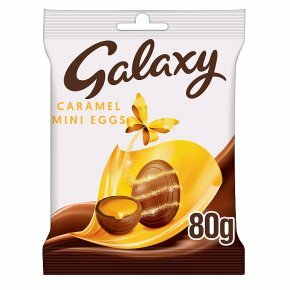 Kosher - KLBD-D. Unwrap each delicate egg to indulge in the delicious smooth Galaxy Chocolate chocolate and caramel.